The Tamer Center for Social Enterprise at Columbia Business School has awarded grants to five up-and-coming social innovators. The social ventures include Eat Offbeat, Praakti Health, Radiator Labs, Visit.org, and Xylem. Read more. What did you do this summer? For 69 Social Enterprise Summer Fellows (SESF), the answer was to generate social impact. Part of the generous Tamer Center gift allowed for SESF to be expanded across Columbia University. Students interested in business, engineering, public health, journalism, public policy, social work, architecture, and more used their knowledge and skills to assist with high-impact projects. Monica Foote SW’16 worked with New Women New Yorkers, a cross-community organization empowering young women immigrants from under served communities in New York City. Leslie Koff BUS’15 worked with Girls Who Code, a nonprofit that works to reduce the gender gap in technology and engineering. Kethan Rao CC’17 interned with The Adventure Project, a nonprofit creating jobs in developing countries by pairing local businesses with large donors. The Nonprofit Board Leadership Program (NBLP) continues to be in strong demand from both current students and nonprofits in NYC and beyond. Now in its ninth year, NBLP has its largest cohort to date, with 42 students participating. Organizations taking part in for the 2015-16 school year include, the Alzheimer’s Association, Bottomless Closet, The American Red Cross, Jericho Project and Teach for America, to name a few. This year, NBLP also has the largest group of EMBA students, with 10 students joining the program. Learn more about NBLP with the video below. Do you serve on a nonprofit board? Are you interested in mentoring an MBA student in nonprofit board service? 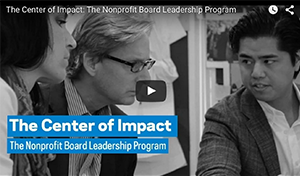 Find out more about the Nonprofit Board Leadership Program.